Despite the survival of untold thousands of science fiction pulp magazines -- which seemingly were hoarded by numerous fans who never heard the term "pulp collector" -- the long-running hybrid title Ranch Romances holds a unique distinction in the world of the rough-paper magazines. It is likely that no other long-running title has been ignored by pulp collectors as often as Ranch Romances. And yet, so many potentially collectible issues survive, due to its immense circulation for more than four decades. Ironically, issues often sell well in antique stores, where thay are purchased by nostalgic female readers. Ranch Romances is also pretty much the least-expensive of the original pulps. Ranch Romances, by far the most successful of the western romance pulps, enjoyed a 47-year run and over 860 issues published from September 1924 through November 1971. The redoubtable Fanny Ellsworth -- who also handled the reigns of detective pulp icon Black Mask from 1936 to 1940 -- effectively edited Ranch Romances for half its existence, and three different publishers, from 1929 to 1953. 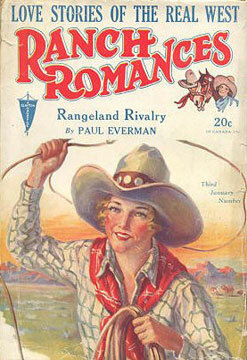 Clayton Magazines editor Harold Hersey took credit for the hybrid concept that produced Ranch Romances in 1924. Editorial duties were handled by Bina Flynn until Ellsworth came along, and the magazine inspired numerous far less successful imitators during the Depression years. Competitors sought to cash in on the title's winning western romance formula that seemingly even the Great Depression could not dent. In his pulp publishing memoir Pulpwood Editor (1937), Hersey calls Ranch Romances "my home run." It was one of the few magazines left relatively unsullied by Depression economics when Clayton Magazines called it quits in 1933. In my book Love on the Racks (McFarland, 2008), I mention one of my favorite editor's quotes from the era, which is Hersey's famous phrase: "There are only two kinds of women in the western pulpwoods -- your sister and nobody's sister." 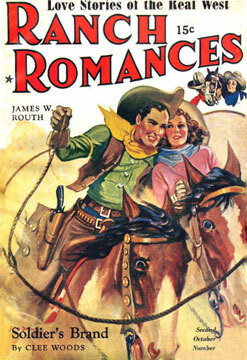 Warner Publications took over Ranch Romances in late 1933. It continued twice-a-month publication, which Clayton had begun in February 1927 after a little more than two years of monthly appearances. In October 1950, the firm commonly known as Thrilling Publications picked up Ranch Romances and produced the hybrid thriller every two weeks like clockwork through January 1958. By that time, Texas Rangers was about to expire after a 22-year-run (with #206, February 1958) as the next-to-last title in Thrilling's once impressive pulp empire. Ranch Romances experimented with monthly, then bi-monthly, before settling on quarterly publication from 1959 to 1971. Unlike many other long-running and highly successful pulp magazines -- such as Amazing Stories and Analog (Astounding) Science Fiction -- Ranch Romances never became a digest, although the magazine did shrink to a 7-by-10, trimmed-edge format in its final decade or so. During that period, Ranch Romances published far more reprints than original stories. Indeed, many issues consisted entirely of reprints, taken from the enormous inventory of publisher Ned Pines, who subseqently gave up pulps and comic books to focus on paperback book publishing. Unlike so many detective and science fiction writers of the pulp era -- along with a fair share of western writers -- the vast majority of men (and it was mostly men) and women who wrote for Ranch Romances during the 1920s and 1930s have long been forgotten. There were occasionally recognizable names -- William Colt MacDonald and Johnston McCulley most prominent among them -- but by and large Ranch Romances was a market for lesser-known, yet competent writers of the era. 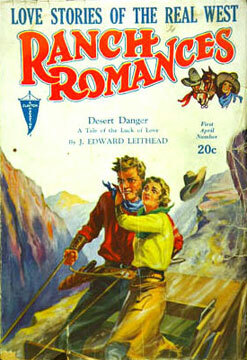 Unlike many western pulps, Ranch Romances contained no series characters. Throughout the 1940s -- as the pulp industry became increasingly squeezed by war-time paper drives and the competition of comic books, paperbacks, radio, film and, later, television -- Ellsworth soldiered on, frequently handling manuscripts submitted by western writers of distinction. They included Frank Gruber, Wayne D. Overholser, Elmer Kelton, Todhunter Ballard, Giles A. Lutz, and Lewis B. Patten. The young Everett Raymond Kinstler -- well before a distinguished career in portrait-painting, which included several presidential portraits -- contributed dozens of marvelous pen-and-ink interior illustrations for Ranch Romances for ten years through the late 1950s. Although it seems unlikely that Ranch Romances will become a "hot pulp" -- if only because the covers are so often understated -- collectors have begun to notice that certain issues, at the very least, are worth a second look. Most stories from the 1950s hold up well today, especially since many of the iron-willed heroines featured in those issues foreshadow today's own independent women. They really are entertaining reading. Ned Pines's publishing empire was justifiably noted for its use of flamboyant pulp, paperback, and comic book covers in the 1940s, but toned everything down considerably in the 1950s, as did many other publishers. The covers of Ranch Romances, however, remain ever-intriguing. Their understated but effective images include heroines in distress, heroines thoroughly in charge of the situation, and heroines looking just a tad come-hither. The one constant is that every cover of Ranch Romances has an attractive heroine. The covers of issues from the 1920s and 1930s are very much a part of that more sensational era. Overt violence was not often emphasized, however, in contrast to themes of beauty and often good-natured romance. The next time you come across a box filled with Ranch Romances, check them out. You might be surprised! Hersey, Harold. Pulpwood Editor, New York: Frederick A. Stokes, 1937. Nolan, Michelle. Love on the Racks: A History of American Romance Comics, Jefferson, NC: McFarland, 2008. Vadeboncoeur, Jr., Jim, Everett Raymond Kinstler: The Artist's Journey Through Popular Culture 1942-1962. A complete checklist of scanned cover images is available @ Galactic Central.